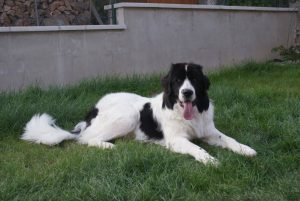 Landseer was breeded from Newfoundland in white-black colour. It is self-confident and strong dog, friendly temperament to people and other dogs, loving water. Its muscularity and its adherence to people are used in water rescue work. He can be nice to children in spite of its size. This breed is appropriate to use also for Canisterapy. It is very well trained according to close contact with people.